Category Archives: Splurge or Save? Style Resolutions: Shopping Your Own Closet! Happy belated 2017, Style Darlings! Hope you’re having just as wonderful and smiley a year as I’m having! The proof is in my Instagram traffic, with a whopping 900 followers as of today! I couldn’t be happier about the progress I’m making in spreading the joy of living the stylish life, one positively coiffed day at a time! I’ve had a great deal of time since the holidays to consider the goals I want to achieve this calendar year, especially when so many new adventures and responsibilities are headed my way. The countless windows of opportunity are open to me in all personal and professional aspects of life, which is why this year, more than any other, will be MY year. Of course, it’s possible that anyone with a keyboard and Wi-Fi connection is declaring just such ownership of 2017 (I mean, I can share)… or perhaps the public is more concerned with other crucial national / international issues regarding where our country is headed. Not to be an ostrich in the sand given the clamorous climate during this weekend’s emotional marches, but I know that the best way I can be true to myself as an American woman, the woman I want to be, and the woman I want my readers to know, is to just be me, to talk about the magic that is life, love, positivity, inspiration, fashion, and all things creative—all the things that give me hope. You may begin to wonder (if you’re out there reading and wondering at all) where this Style Darling chick is going with this setup of resolutions? The title of this post basically points to “shopping your own closet” (and I’ll be getting to that more directly in just a moment, so please bear with me). Well, the arsenal of style that I have packed away on hangers, stuffed under my bed, and still stored at my parents’ house from over three years ago are the external representations of what I wish to express as my hopes for this year. On the inside, the strength that I’ve recovered from thirty three years of life experience has allowed me a much greater and more valuable inventory, if you will, of knowledge that I will claim as much as I possibly can. When I’m putting together an outfit. When I’m making my morning tea. When I’m listening to the La La Land soundtrack. When I’m tutoring students about syntax. When my hand is held while hustling through the streets of New York City. And for every lovely moment in between. That knowledge simply includes the promise that I will embrace the richness of every day. I will be present. I will speak up. I will appreciate the time I have to myself and with my loved ones. I will always be my best self; both the world and I deserve it. In doing so, there are also some worries that make the drive to win the year a little more challenging. Among these, finances are always on my mind, which is why I’m committed to better shopping resolutions, only seeking unique and special must-haves unlike anything I currently own, as well as reinvesting and shopping my very full and fashionable closet with favorite wardrobe staples. In a conscious effort to mind my spending, I’m looking at how unexpected pieces can be played down and how basics can be styled up. Since I have the liberty of taking my style into my hands at both of my jobs, as an educator and stylist, I’m free to explore what inspires me on social media, in magazines, from the people around me, and within my imagination. However, it has been quite the exercise in self-control since I will no longer, at the swift swipe of my credit card, buy any and every affordable sparkly thing I see online or in stores. No matter how sparkly it is. Really. I’m certainly not punishing myself for past indulgences, but in moving forward to wherever the future takes me, I hallucinate a little bit that I’ll end up being a real-life Miss Havisham of the 21st century, but of the clothing hoarder variety. And now for the moment you’ve been waiting for… I’ve also recently been very careful about what I look at when it comes to seeking out style inspiration in stores and online, because it is oh-so tempting. However, I found the below affordable and chic graphic tees (gray, cream, black, & navy) from Old Navy for $15.00. 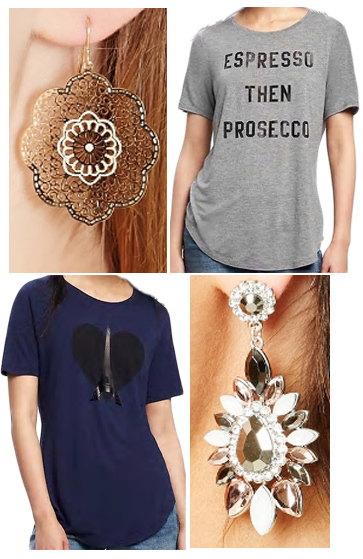 I was immediately inspired to give these t-shirts the style blogger treatment they deserve, especially since I’m all about Prosecco and Paris. 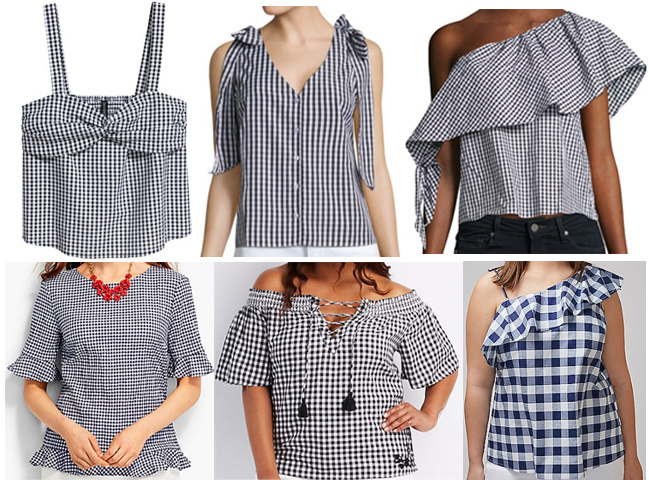 Upon discovering these tops, I went on a sort-of text rant about how they should have been presented on the Facebook post I initially saw them on, but also in how they are so plainly styled on the website. 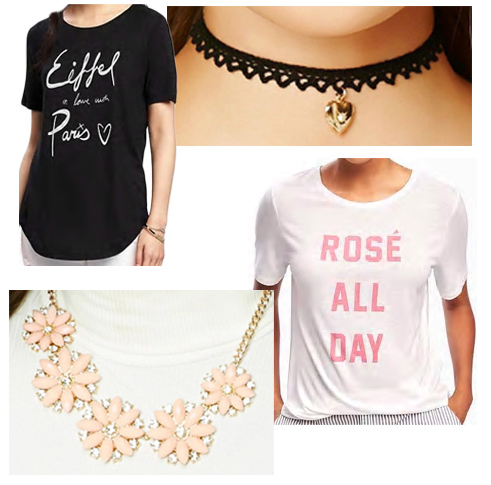 A simple pop of jewelry takes these tees to the next level, while staying true to any mix of ladylike and modern style where casual meets cool. In addition, to build a budget-friendly shopper-savvy collection, these tees are perfect for Style Darlings of any size, ranging from XS-XXL in each of the designs. As for the jewelry (filigree earrings, drop earrings, choker, & statement necklace) from Forever 21, there’s no better place to shop when selecting something special, while also saving some cash instead of splurging on luxury sparkles. To take these tees even further, think beyond your favorite pair of skinny jeans and try a sequin pencil skirt with a denim jacket, or a midi skirt and blazer. Also, when it comes to footwear, t-shirts are always compatible with ankle booties, ballet flats, strappy sandals, and knee boots. If you need further proof, just click around on Pinterest and take a fashion risk! That’s all from me. Have questions? Have inspiration you wanna chat about? Let’s hear it. Happy 2017 and Happy Styling!